After the unbearable expectations set by our last blog post, we’re really quite excited to be able to give your a run down of the first of our brand new features today. So, without further ado, please allow us to introduce…(fanfare of trumpets)… LiveCash! 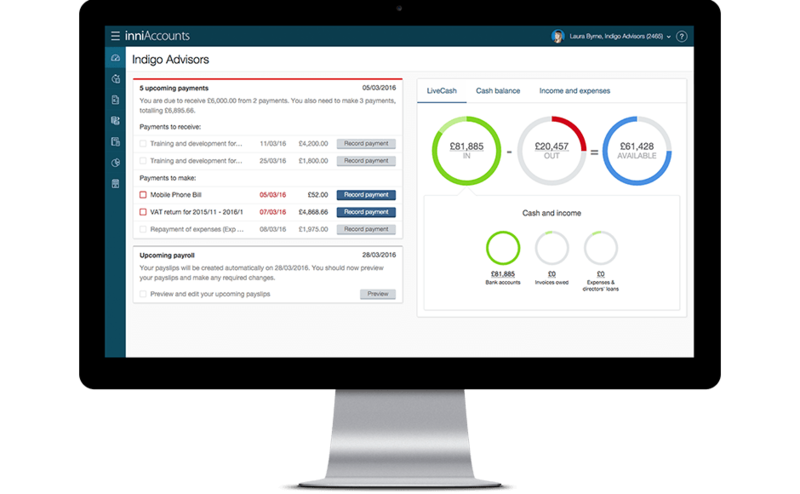 LiveCash is the new engine room of inniAccounts, where you can quickly access all of your most vital financial information and find it presented in the clearest possible way. It gives you a real, live view of the cash you have available using absolutely no accounting jargon, and shows you exactly how much physical cash you have to spend right at this moment. With LiveCash you can stay on top of your upcoming bills, drill into the details of your income and expenditure and even customise the way you view your accounts in order to see what you want to see, the way you want to see it. Aside from these and many more brilliant tools, what makes us so excited about LiveCash is the fact that it’s totally unique: whereas most online software displays your accounts in terms of profit and loss, LiveCash gives you a real time view of your available cash as it stands today. The moment you input a new item of expenditure or income into the inniAccounts system it will simultaneously appear in LiveCash, which means you accounting information is always up to date and always available. If you’re a Premium or Plus customer you’ll find LiveCash sitting at the top of your homepage, so please do give it a test drive the next time you log in. If you’re currently using Lite why not drop us a line to discuss upgrading your account? It’s easy to do and it’ll give you instant access you LiveCash and many other upcoming new features. Finally, we’d love to know what you think of LiveCash so that we can make it even more useful in the future – if you have any feedback please feel free to contact the team as we always like to get your views. Oh, and stay tuned for news of more new inniAccounts features designed to put your finances at your fingertips!